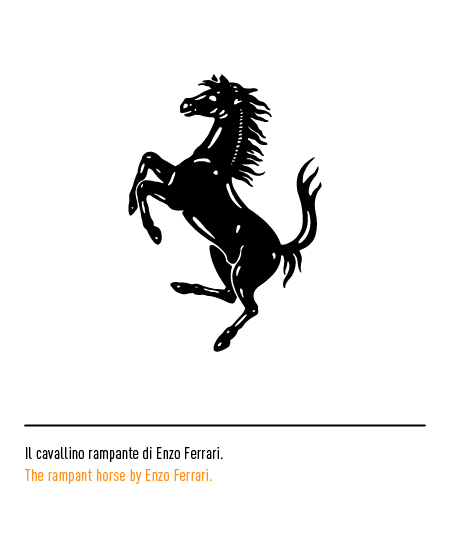 Ferrari's famous rampant stallion can be traced as far back as 1692. 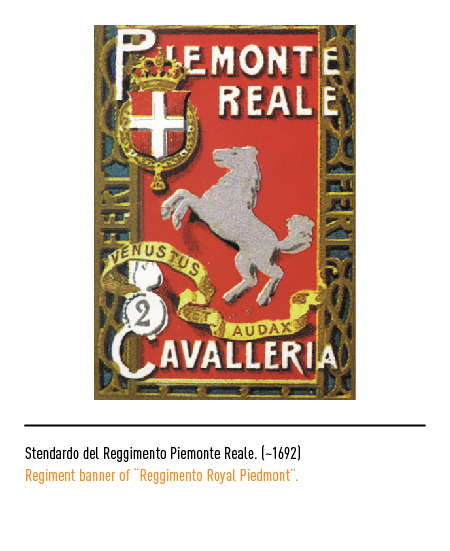 In was in this year that Vittorio Amadeo II, Duke of Savoy, founded the Royal Piedmont Regiment, one of the most glorious cavalry outfits of Piedmont and Italy. 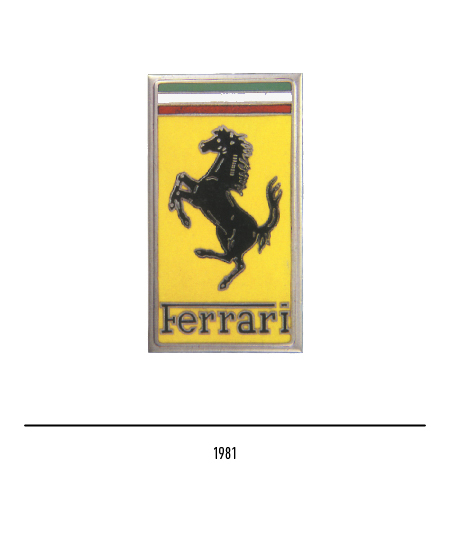 Various military reorganisations later, the Regiment was finally to adopt fire-red as its colours to be displayed on lapels, hand cuffs, and on a strip down trouser legs, while its insignia was a rampant stallion. 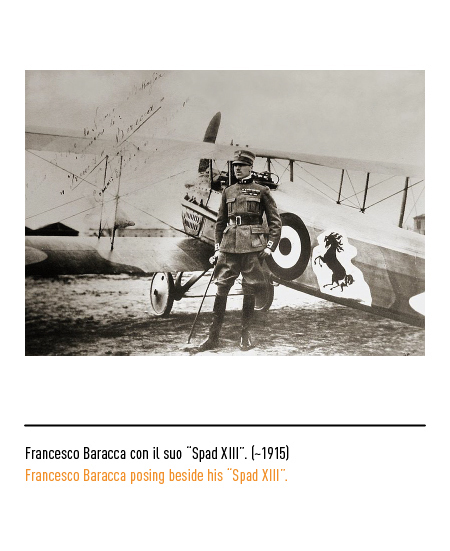 More than two centuries after Italy's first airborne squadron was formed during World War I. 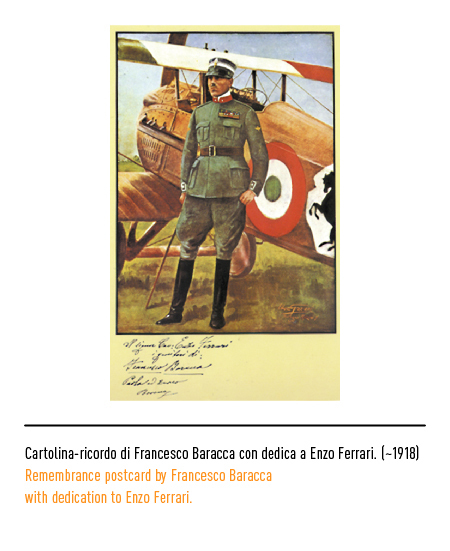 One of the first cavalry officers to join the squadron the famous World War I ace, Francesco Baracca. In view of his military origins he had the rampant horse painted on the fuselage of his bi-plane, a symbol that was to become acknowledged as his own personal coat-of-arms. 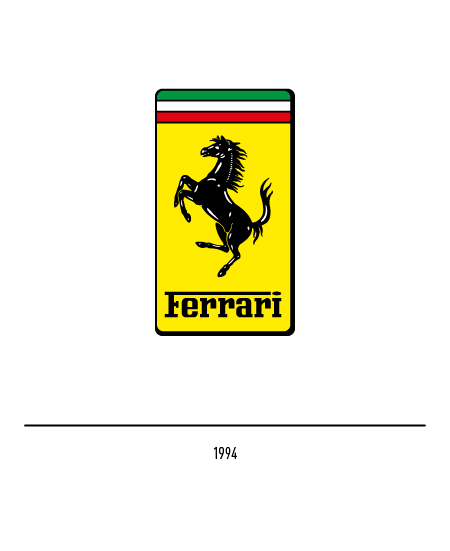 There is actually another fascinating story told to account for the origins of the Ferrari trade-mark. It seems that fighter pilots had the custom of having their vanquished adversaries' heraldic devices painted on the fuselage of the aeromobiles (see Alfa Romeo). 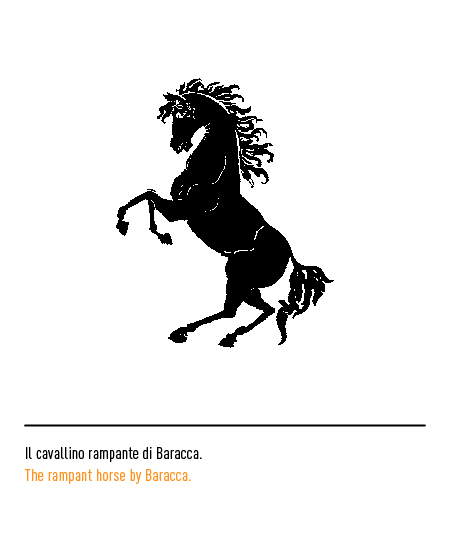 According to the alternative story, the symbol with which Baracca is so closely associated was depicted on the fuselage of his bi-plane after he had shoot down an enemy pilot from Stuttgart, a town whose heraldic device is a black rampant stallion (even though some give it as a mare). 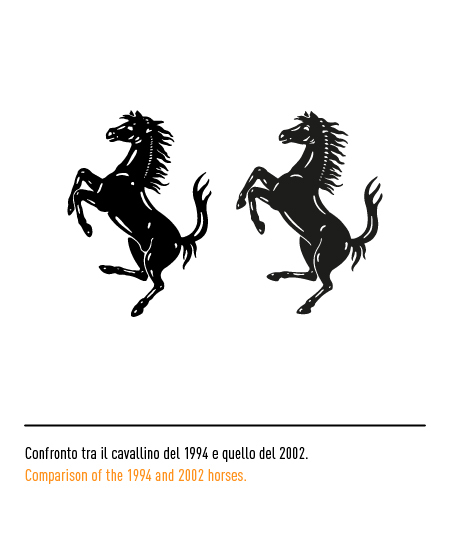 Indeed, Ferrari's equine figure displays the same upturned tail. 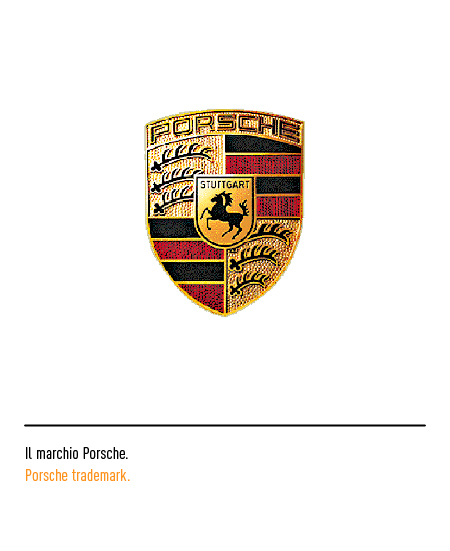 The Porsche trade-mark is also adorned by the figure of the Stuttgart mare. 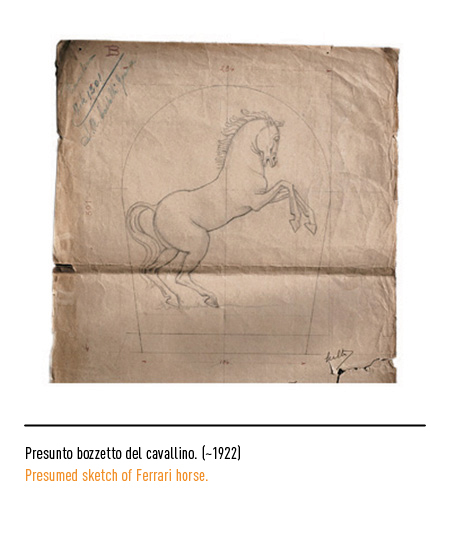 Be it as it may, the only official painting depicting Francesco Baracca and his bi-plane was done by Ettore Graziani of Bologna and in this picture, or at least in the post-card his parent's had made up after their sons death, the horse is incomplete as its rear end is cut out. 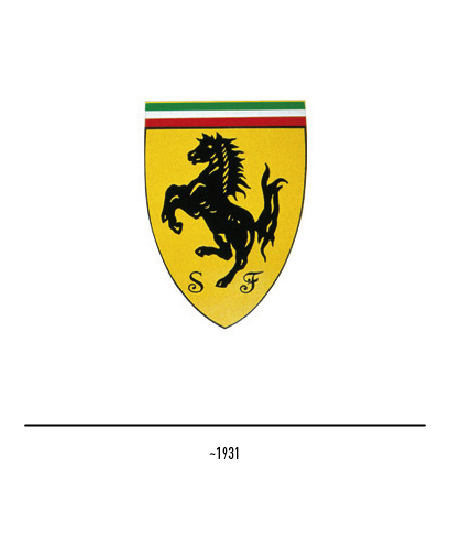 In any case, in 1923 this symbol of speed and bravery was entrusted by Enrico and Paolina Baraccca to the winner of the "Circuito automobilistico del Savio" ("Savio racing car circuit") race in Ravenna, Enzo Ferrari, for him to carry on the memory of their son who had died in combat on Mount Montello near Treviso during the Great War. 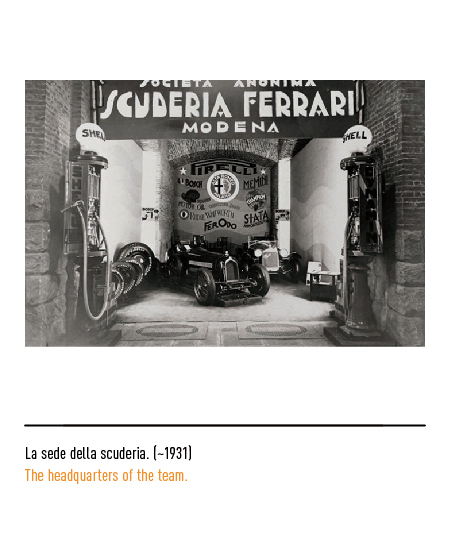 In 1929 Enzo Ferrari opened the "Scuderia Ferrari" ("Ferrari Stable") in Modena as a mechanical racing car workshop and subsidiary of Alfa Romeo. 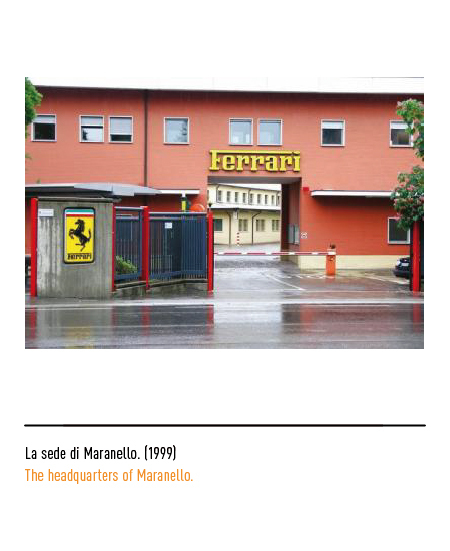 Then, in 1943, the house was moved not far from Modena to Maranello on land owned by Ferrari. 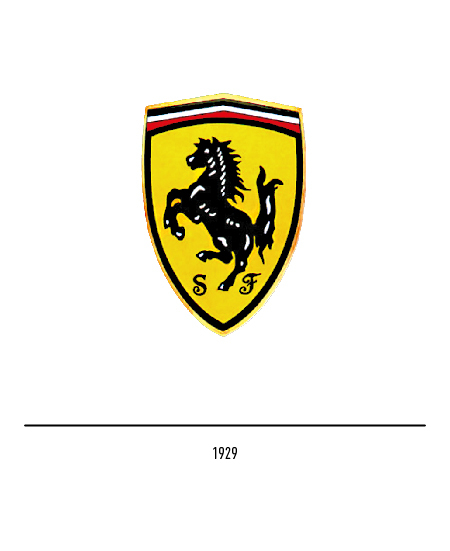 The little black horse standing on only one hind leg with is tail characteristically up-turned was set against a canary-yellow (the colour of Modena) background with an upper border bearing the national colours of Italy. 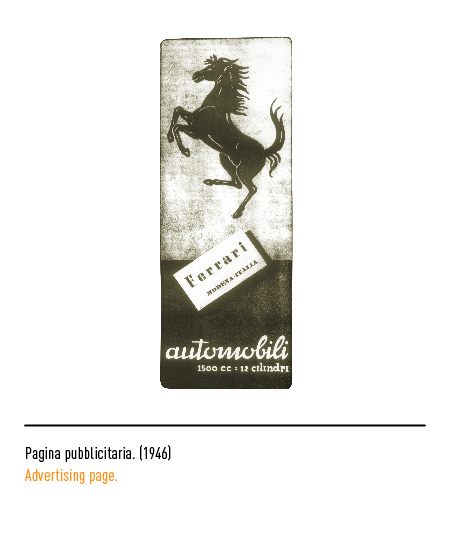 The iconic device started appearing on all of the Scuderia's publications, signs, letter-headed paper, and official documents, but not on the cars themselves that continued to sport the Alfa Romeo trade-mark. 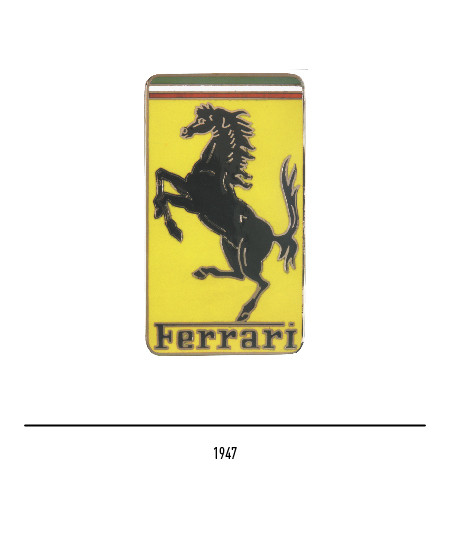 The championship shield on the cars first put in its appearance at the 1932 edition of the 24-hours of Spa in Belgium, in which motor-racing competition Scuderia Ferrari had entered two cars. 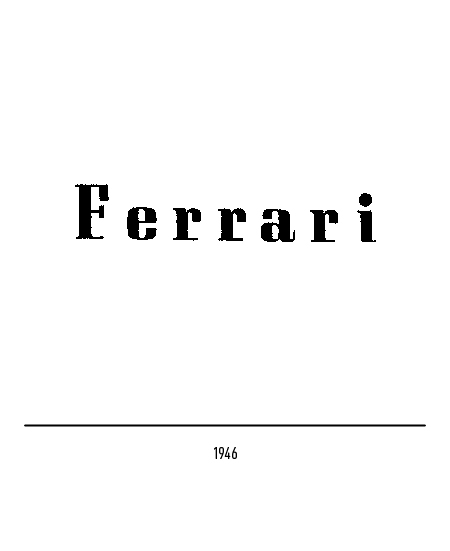 In 1947 Enzo Ferrari began making the cars that were to carry his name. 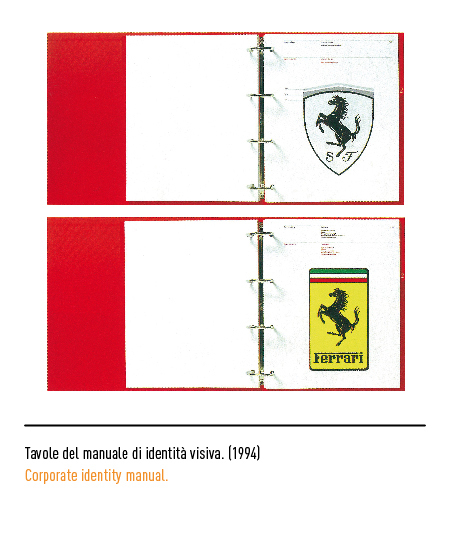 In addition to the shield-shaped trade-mark a square trade-mark with the founder's family name was also designed. 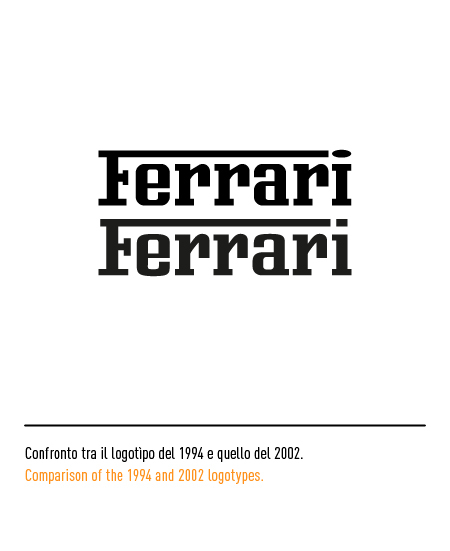 Its lettering with serifs was well spaced-out and was used as reference for the restyling of the logotype. 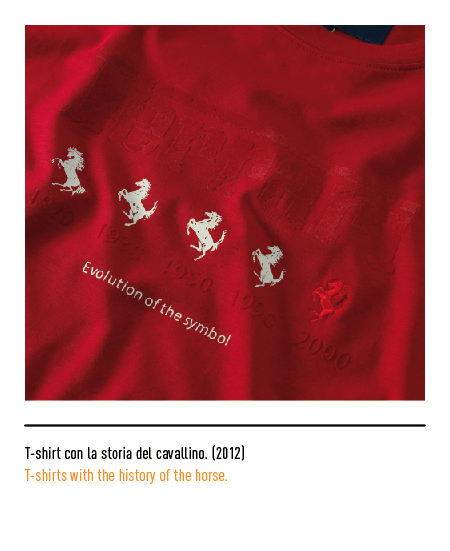 In the first rectangular trade-marks the horse's hoof touched the upper bar of the "F" in the logotype. 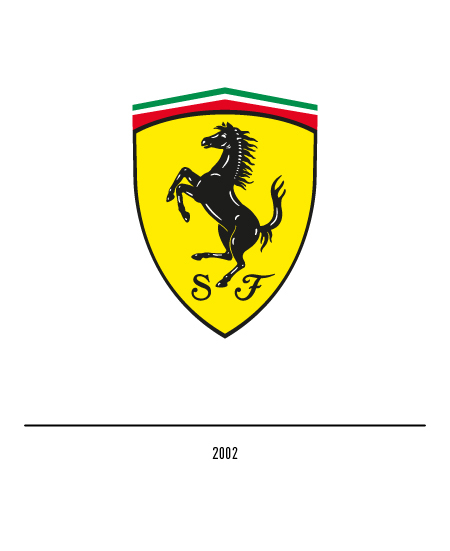 The latter logo is affixed to all Ferrari-constructed vehicles, be they saloon or competition cars, while only official racing cars sport the shield-shaped one. 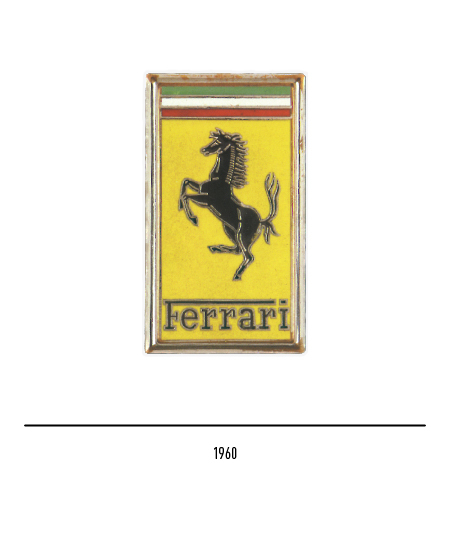 Shape- and appearance-wise, in over sixty years of the Scuderia's and the Ferrari marque's history the trade-marks have undergone a continuous but gradual and limited change. 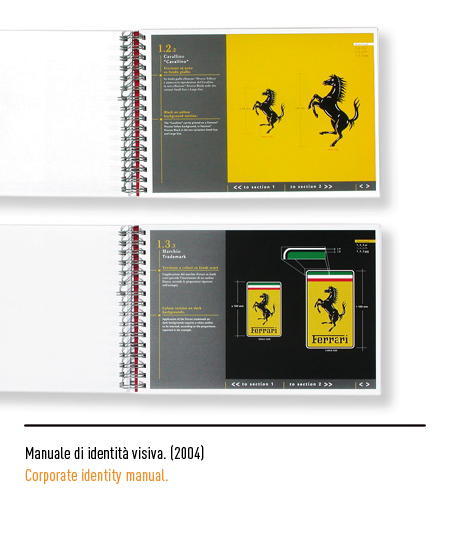 Ferrari's distinctive iconography was consolidated with the publication of the house's visual identity handbook edited by Pierluigi Cerri in 1994. 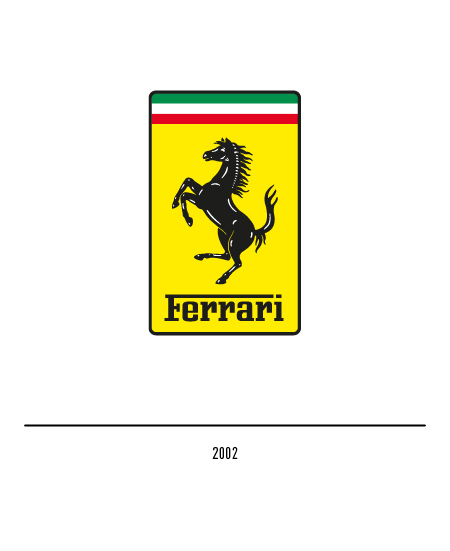 The restyling was done by the Seidlcluss agency. 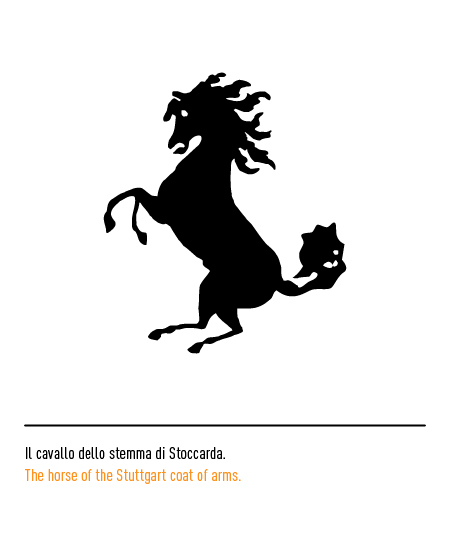 The stallion's eye was touched up and the position of its legs set right, while logotype lettering was optically corrected as was the rectangular dot on the "i". ARCHIVIO FERRARI 1993, Pubblicazione Ferrari SpA, Modena, 1993. 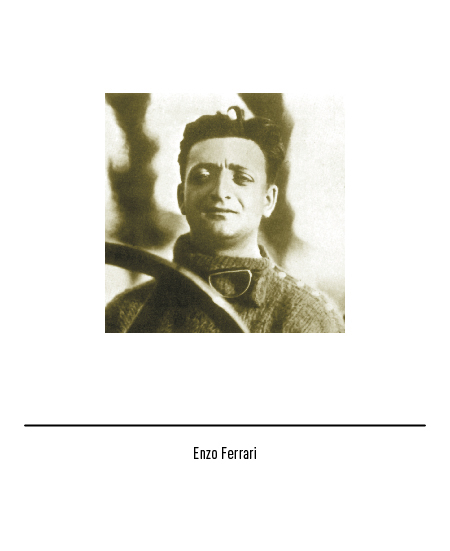 GENTE MOTORI, Rusconi Editore, Milano, anno XXV, numero 2, febbraio 1996. Silvestro Serra, “È tutt’oro quel che look”, in Panorama, 1988. Mauro Bacciglieri,Giovanni Battaglia, OK FERRARI, Edizioni Virgilio, 1980, Milano. Igino Mencarelli, FRANCESCO BARACCA, Ufficio Storico Aeronautica Militare, 1969. 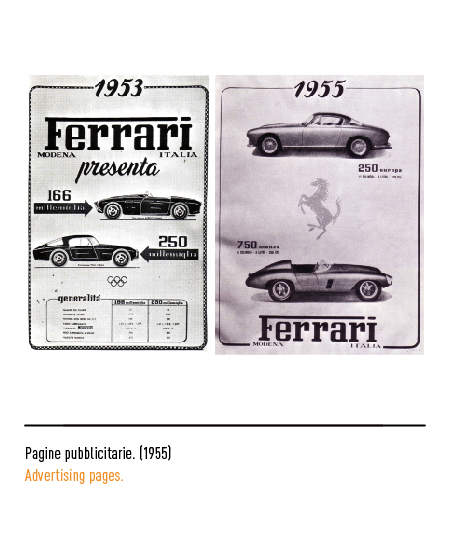 Gianni Cancellieri, “Purosangue rampanti”, in Autosprint, n.13, 2002. 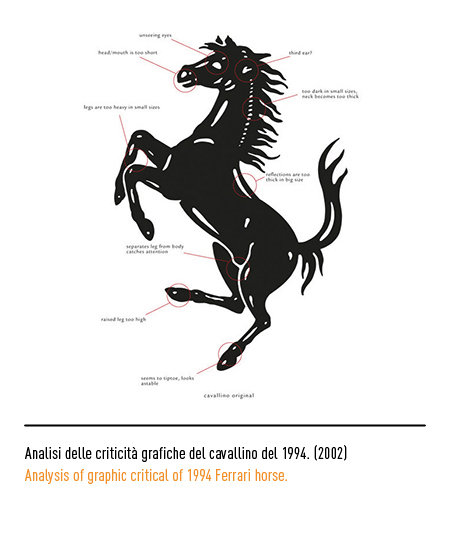 “Il mito del cavallino rampante”, in Cavallo Magazine, Nicoletta Vian, n. 116, Solitaire, Bologna, 1996.